www.johnseed.com: Hearne Pardee and Gina Werfel: [ he said, she said...] at Adler and Co.
Hearne Pardee and Gina Werfel - both of whom are painters that teach at UC Davis - are the subjects of a double solo show at Adler and Co. in San Francisco: [ he said, she said...] As a married couple who have developed their parallel careers over four decades of partnership, Hearne and Gina have developed complimentary artistic practices that overlap into a kind of ongoing conversation. 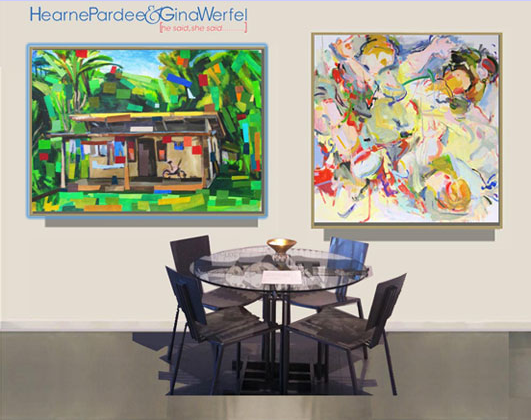 Pardee's plein-air paintings of suburban dwellings are disrupted and enriched by boldly applied collage elements that create a pleasing and challenging sense of visual complication. 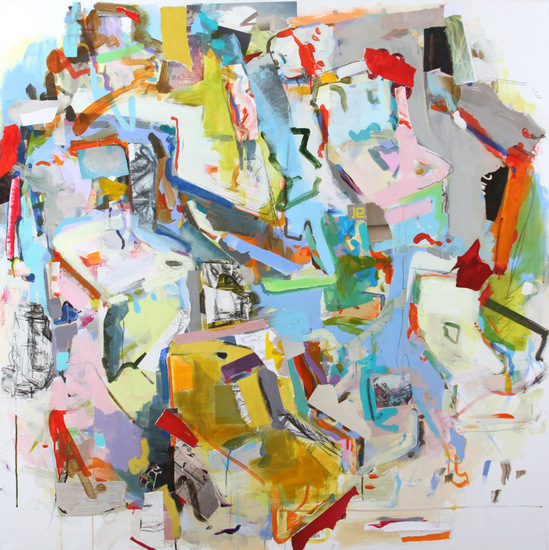 One of his stated aesthetic goals is to use color to provide a connection to memories and unconscious associations. Werfel has a feeling for gesture, and uses it to conjure up both spatial references to the landscape and the human body. 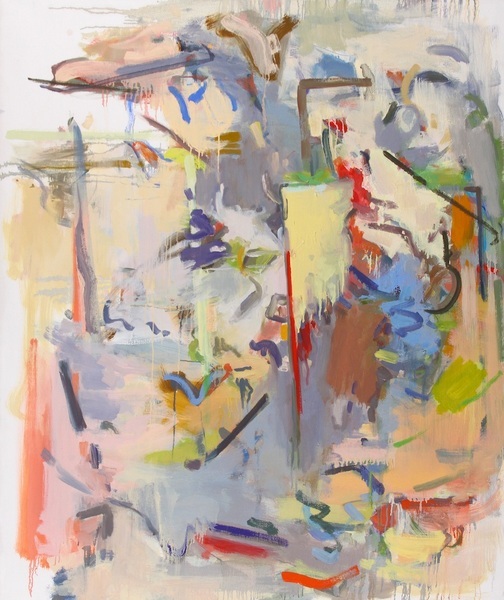 "Space," she asserts, "is created through the vestiges of gestures left embedded in the process of painting itself." I recently interviewed both artists to ask about their backgrounds and interconnections. How did the two of you meet and develop your concurrent artistic practices? HP: We both studied at the New York Studio School in the 70s, where we were influenced by Leland Bell and Mercedes Matter. Both emphasized work from observation, with Mercedes coming out of the Hofmann tradition, which took spatial relationships observed from the model into abstraction. I began painting outdoors while there, and Gina came along a couple of years later. GW: While still in graduate school at Columbia, I won an award from the Artists for the Environment to be a resident artist at Bear Mountain with several other artists who used nature in diverse ways: Melissa Meyer, Ned Smyth among others. I discovered during my stay that painting rocky stream beds served as metaphors for Renaissance and Mannerist figure compositions that I had studied as a student in Italy and moved my work closer to abstract rhythms. How did you each find your artistic directions over time? HP: I worked with Philip Guston, who was teaching at the Studio School then, and under his influence I produced the "Night" painting. He told me then that I wouldn't ever go back to work outside after having that experience, but I was never totally convinced, and began keeping both work from observation and more abstract work going at the same time. Gina kept painting outdoors but became much more involved with gestures and painterly marks when she started painting outside the city. I kept looking for right angles in the woods and Gina found a connection to organic forms to construct space. GW: I painted outdoors from observation for many years, using the landscape to generate active and gestural compositions. 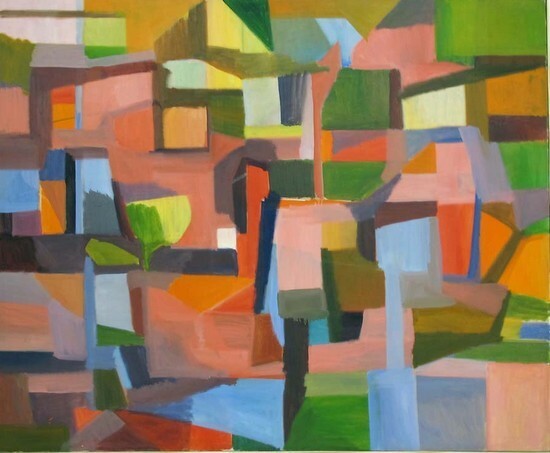 After the move to California in 2001, I transformed my search for abstraction in landscape into large paintings that were mostly about the mark and sensuality of paint, but still retained some semblance of landscape elements and/or the human figure. Can you tell me about how each of you became involved in collage? 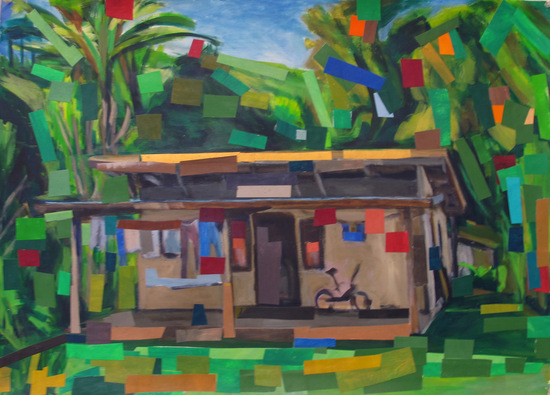 HP: I began doing small collages based on the outdoor paintings in 1980, trying to get more involved with color. When we moved to California in 2001, we both painted outdoors for several years, but then began to change. Gina began making abstractions in the studio and I began making large collages in acrylics; the colors I added became less about enhancing the colors in the subject and more about making new relationships emerge from the field - in this sense I see myself going back to the way I worked in "Night", although now including work from observation (I start the collages with painting outdoors). GW: More recently, my work has started from fragmented mash-ups of old dolls and our son's childhood drawings to generate dynamic compositions. 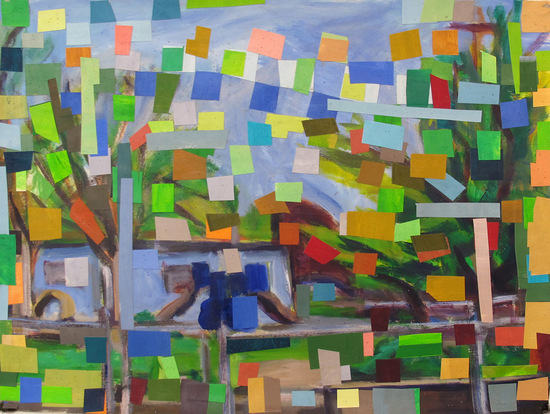 My practice also incorporates collage and acrylic on paper and panel, with irregular bits of collage functioning as resting points in energized spaces. A range of high-key and neutral colors is combined with a fluid geometry in the paintings and mixed media works. Where do your practices intersect and where do they diverge? GW: Our practices intersect through our common artistic training at the New York Studio School. We were both trained in the legacy of Hofmann's teaching of "push-pull" planes in space and how abstraction underlies even the most realistic rendering of forms. 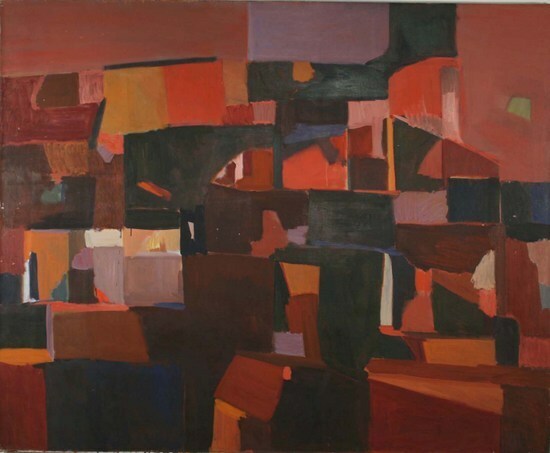 I look to Hearne's work for its architectural solidity and its careful demarcation of color relationships coming out of his training at Yale under Sewell Sillman, a student of Albers. My work deals more with the chaos of marks and unresolved forms, and yet, an underlying architecture of forms in space is what holds my paintings together. Where our practices diverge? Hearne's is architecturally based, mine more organic and intuitive, bordering on all over chaos. However, at the same time, we both relish the risk taking of process based work, such as gluing down a piece of collage, only to cover it up with a corrected notation. HP: I see the main intersection in the way we both work with overall space, which includes both work from observation and abstraction - the way forms emerge from the field. I think the big change in modern art comes with the idea that creation is more a way of organizing the field rather than depicting a model. I go much more into the way this idea involves the grid and frame, and ground myself in direct observation, where Gina gets more into gestures and spontaneous marks. I'm more concerned with a sort of ethnographic approach to the everyday environment, more documentary. What does it feel like to see your works hung together in a single show? GW: We have shown together in the past, however, in different contexts, where our work tended to be treated as solo shows side by side. 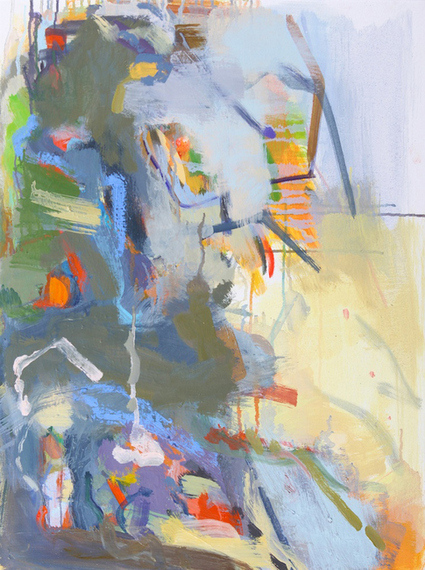 The Adlers have hung this show differently, where the show's title (he said, she said) truly speaks to the differences/similarities in each of our works, and yet our works are investigating similar issues, such as a figure in space, a set of abstract colors and forms jostling for space. My works fracture space and form, whereas Hearne's hold forms together in a solid envelope of space. I love what a painter friend said about the show tonight, that it is a call and response kind of pairing. 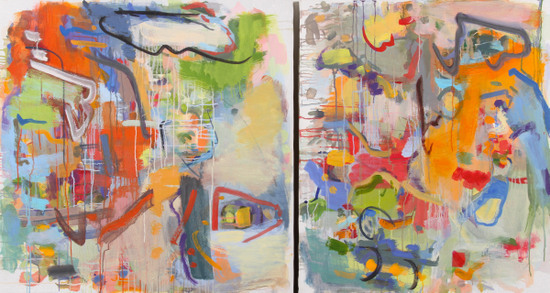 It is hung densely, challenging the viewer to contemplate convergences and diversity in the works side by side. 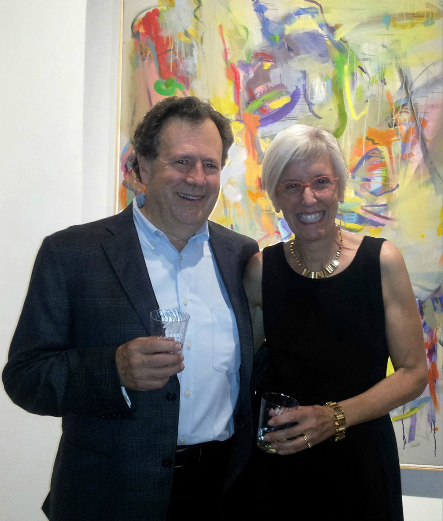 Does our partnership (both personal and artistic) reveal itself in the works on view? HP: It sounds corny, but to me they reinforce one another and I'm pleased by the way we each hold our own. We've provided a context for one another as we've developed in our own directions, and of course as we've both responded to other artists' work - that's been especially true with our move West, where a lot of this development took place, where we relied on one another in a new environment and dealt much more directly with artists we'd always looked at from the East Coast - Thiebaud, Diebenkorn and David Park in particular. But it's also sobering to look at this overview of our work, for me encompassing 40 years, and to think about where we go from here.